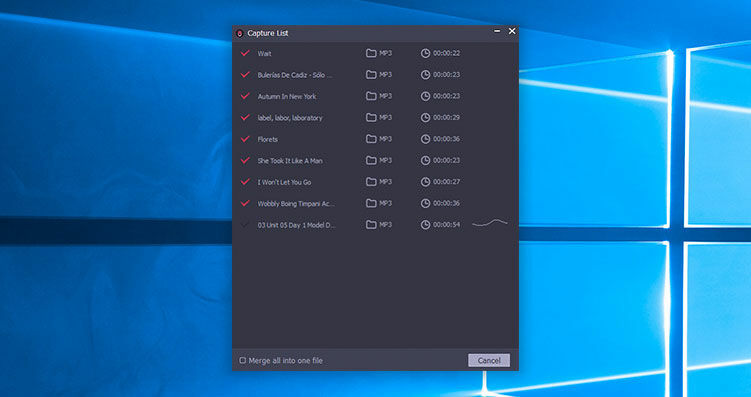 TunesKit Audio Capture can capture any audio playing on your computer in Windows. It can record in popular formats including MP3, WAV, AAC and FLAC. It will preserve ID tags too if possible. It can capture just about any sound that your computer''s soundcard outputs, including streaming music, live broadcasts, in-game sound, movie soundtracks, etc. It can also capture audio played by iTunes, Apple M usic, Pandora and more. You then go on to split, cut and mix audio recordings within the application.